Daily Mirror - Sobitha Thera’s vehicle missing? A complaint has been lodged with the Mirihana Police that the luxury vehicle used by late Ven. 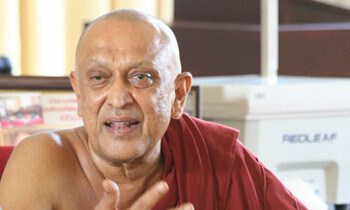 Maduluwawe Sobitha Thera, the former Chief Incumbent of Sri Naga Viharaya in Kotte, had gone missing. The complainants had said in the complaint that they received information that the missing vehicle was being used as a wedding car at a hotel in Beruwala on Tuesday but they could not locate it at the hotel. When asked, Ven. Kelaniye Soratha Thera, a monk of the temple, said the vehicle had not gone missing and that it was parked in another place due to a technical fault. The thera said it was parked there to repair it later as a huge amount of money was required to do so. Ven. Soratha thera said police did not take a statement from him and that he was ready to inform the police about it when he was asked. He said this was a false complaint lodged as a result of a dispute over property of the temple. Probably the RAW agents took it back. Lets check the Indian embassy premises. I think it is time that all religious properties must be taken over by state. State must ensure freedom of all religions by the constitution and therefore properties should belong to state. Lord Buddha felt that material wealth was not life's ultimate goal. so why luxury vehicle for you? The State does not need to take any religious wealth if those religions are practiced genuinely. For example, why does a Buddhist monk who leaves all pleasures in life and takes to a life of monkhood have a super luxury vehicle in his possession? It is not proper to make adverse remarks on a person who is not with us. However, somebody who betrayed the country and enjoyed the life with all the luxury cannot be spared. You cant respect a Buddhist monk who does not follow the teachings of Lord Buddha. I think Sobitha Thera's Yahapaalana Concept also missing now. Whether a Monk or a Politician, they should be given a good vehicle to go around the country if they are working for the country's welfare.